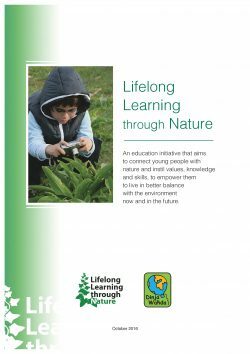 Lifelong Learning through Nature is a collaborative partnership project between BirdLife Malta, the Ministry for Education and Employment (Malta), the Royal Society for the Protection of Birds (UK), BirdWatch Ireland, and the Polish Society for the Protection of Birds. The project is funded with support from the European Commission. This project is designed to develop an environmental and sustainability education programme which engages young people aged 5-21 in Malta, through formal education, vocational training courses, non-formal and informal education. The project will also provide documented evidence to show the importance of connection with nature for health, well-being and education, which can be used by international project partners to support implementation in their own and other European countries. The project aims to achieve these objectives by enhancing transnational cooperation between education and training providers and other stakeholders. By working together we can share best practice and learn from each other to develop transferable resources suitable for the different age groups. Here you can find a brief summary and selected preliminary research results of a study which was carried out as a result of cooperation between BirdLife Malta and the University of Malta, as part of Lifelong Learning through Nature (LLN). This study is a very important step for BirdLife Malta to assess the success of its education work. There was a great deal of positive feedback from both students and teachers, and the Nature Watch reserve visit was shown to be impactful for them. Seeing that there is a need for more outdoor learning in Malta is very positive. As this study confirms, students need to improve their knowledge about their local environment and about global conservation and developmental problems in general. This study will hopefully be very useful for the partners involved in the LLN programme and will inspire research and improvement in the participating countries wishing to strengthen their education programme for sustainable development. Click on the picture above to read the study results.